But before we get to Christmas, perhaps we should focus on Thanksgiving and the beautiful season of fall. That’s the cue for this soup to come out from behind the curtains and take center stage! You’re looking at the very first batch of butternut squash soup I’ve ever made and it won’t be my last. I may try a different recipe next time, because one thing I learned on this small journey is butternut squash soup can be made to suit multiple palates. More on that below with the recipe itself. I was lucky enough to get my butternut squash for free when we went shopping at my great uncle’s pumpkin farm; he was overly generous sending us off with pumpkins, gourds and squash. If you ever find yourself randomly driving by St. Clairsville in the fall months stop over at Groves’ Pumpkin Farm. It’ll be that time when you see the sign and say ‘wait a minute, why do I know this name?’ You’ll find a good old fashioned business with kind people and quality products. Below is a sneak peak of his photogenic country property. Until that time of year comes around again, may I suggest you spend some of your time trying butternut squash soup recipes? It could be a perfect first course for your holiday. Check out the notes after the recipe for ideas on different versions of soups; Pinterest will be your best friend for finding the detailed recipes. 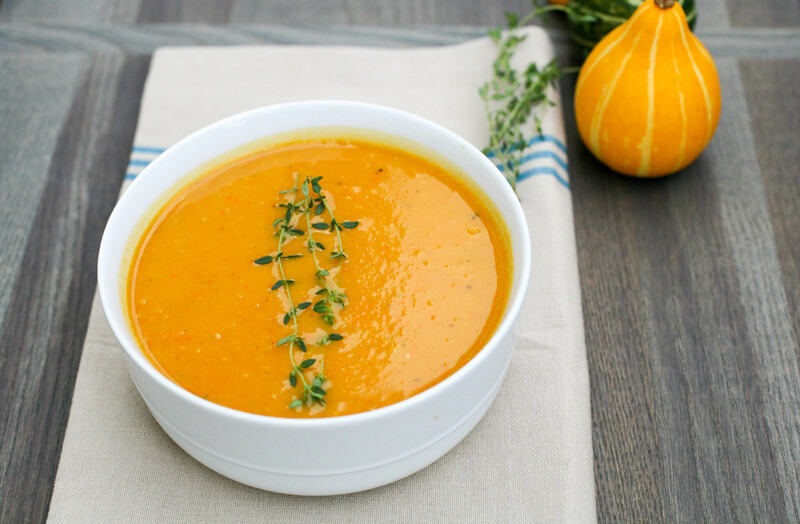 And if decorating isn’t quite your thing, a bowl of this soup at each place setting will make a lovely Thanksgiving table. Peel and chop squash and carrots into cubes and place in roasting pan. Chop celery and onion and add to roasting pan. Peel garlic and add whole cloves to the pan. Add herbs to the vegetables, sprinkle on cayenne pepper, salt and black pepper, pour olive oil over everything and toss to mix well. Roast in the oven for one hour at 350 degrees. Remove from oven and remove the stems and add 'leaves' back to the pan of vegetables. Gradually add to a food processor with one cup of vegetable stock. Puree until a smooth consistency is reached. Pour mixture into a medium sized pot on the stove and add remaining 2 1/2 cups of vegetable stock. Stir well. Allow soup to simmer over low heat for 10-15 minutes. Serve with your choice of garnish. *For a thicker/richer soup, add some cream when pureeing. *For a nice fall flavor, try omitting the sage and add curry, nutmeg and allspice. *A little more sweetness? instead of the above herbs and spices use maple syrup, ground nutmeg and butter. Garnish with cinnamon before serving. This entry was posted in Dinner, Recipe Book and tagged butternut squash, butternut squash recipes, comfort food, fall soup recipes, roasted butternut squash soup, soup. Bookmark the permalink.